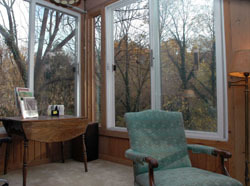 Martha’s counseling office is centrally located in Clifton, with privacy and a peaceful view of a lovely wooded ravine. All counseling sessions are by appointment, with daytime, evening and Saturday times available. If needed, an appointment can usually be scheduled within 48 hours after your call. Martha attempts to hold fees at a level that most people can afford. Fees are charged by the amount of time spent, not by the number of people present. Typically counseling sessions are 45 – 50 minutes in length. She is an approved provider for many insurance companies and employee assistance programs. If her service is covered by your insurance, Martha will file the necessary paperwork. Fees and co-pays not covered by insurance are payable at the time of service.